(AFP) - Fears of a second dam breach at a Brazilian mining complex receded Sunday, enabling a search to resume for the more than 300 people still missing two days after a dam collapse that has killed at least 58 people. Loudspeakers rang out at 5:30 am (0730 GMT) among homes surrounding the Corrego do Feijao mining complex in southeastern Brazil, warning of dangerously high water levels, according to mine owner Vale. Workers at the complex are still reeling after a barrier at the site burst on Friday, spewing millions of tons of treacherous sludge and engulfing buildings, vehicles and roads. Firefighters halted the search for survivors and immediately began evacuating communities near the dike, which contains at least three million cubic meters (800 million gallons) of water. But several hours later, civil defense officials gave the all clear. "There is no more risk of a break," said Lieutenant Colonel Flavio Godinho, a spokesman for the state civil defense agency, explaining that the high water levels had been drained off. "The search has resumed -- by land, by aircraft and with dogs." Dozens of helicopters were set to be deployed because the thick mud was too treacherous for ground rescuers. The latest official toll from the dam breach was 58 dead and 305 missing, according to Godinho. He said rescuers found a bus full of bodies. Vale, the Brazilian mining giant, said people were being allowed to return to their homes. "I had to leave with my family, my children," Jose Maria Silva, 59, told AFP. Fagner Miranda, 29, added: "several people ran out, desperate... Those with no car fled on foot, with a backpack on their backs and what they could carry." So far, 192 people have been rescued alive, 23 of whom were hospitalized with injuries, officials said. President Jair Bolsonaro flew over the devastated zone on Saturday, later tweeting that it was "difficult to not be emotional before this scene." The disaster was the first big emergency faced by Bolsonaro and his government since he took office in early January, and it may be one of the deadliest disasters in Brazil's history. Workers at its mine had been at lunch in an administrative area Friday when they were suddenly swamped by millions of tons of muddy trailings -- a waste byproduct of the iron-ore mining operations. 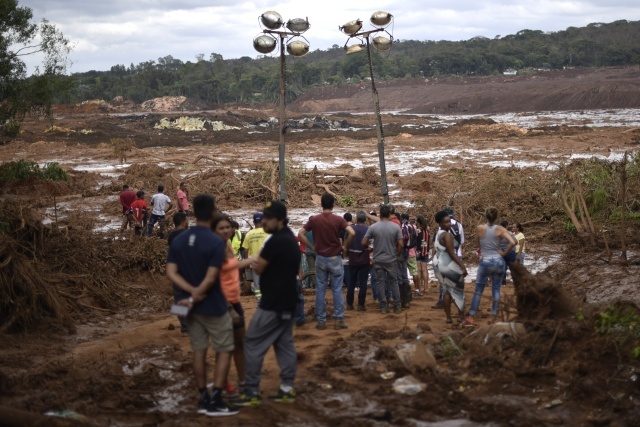 After overflowing a second dam, the muddy mass barreled down toward Brumadinho but only glanced along the town's edge before roaring through vegetation and farmland, smashing houses and swallowing tractors and roads in its path. Brazilian judicial authorities announced they had frozen $3 billion of Vale's assets, saying real estate and vehicles would be seized if the company could not come up with the full amount. The company also has been hit with fines by the federal and state government totaling some $92.5 million. Vale share prices fell Friday more than eight percent on the New York Stock Exchange. The mining company, one of the world's biggest, was involved in a 2015 mine collapse elsewhere in Minas Gerais that claimed 19 lives in what is regarded as the country's worst-ever environmental disaster. Another woman, Suely de Olivera Costa, was desperately trying to find her husband, who worked at the mine. She angrily accused Vale of "destroying Brumadinho, and nobody is doing anything -- which will be the next town?" The Brazilian branch of environmental group Greenpeace said the dam break was "a sad consequence of the lessons not learned by the Brazilian government and the mining companies."